13 gallon square buckets have almost the same traits with the 8 gallon square buckets. They're big (huge even), they are white, they have recessed handle and hinged lids, and they are food grade. And like 8 gallon square buckets, probably only businesses and large households will make use of them. Or maybe not only them. For a family or a business that is thinking to relocate somewhere else, the 13 gallon EZStor square buckets could be a nice option to replace the less sturdy cardboard boxes. Of course the normal cardboard boxes are perfectly fine to contain light and small-in-volume things. But if you want to fill them in with heavier things, then a 13 gallon square bucket is obviously a safer and stronger choice. 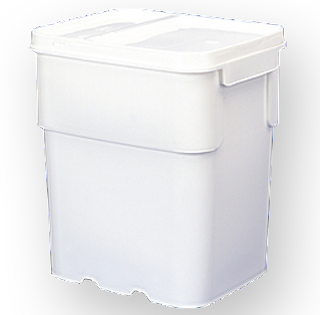 Unlike the other EZStor Square pails that we have, the 13 gallon square buckets are available to purchase individually (no packages of minimum number of pails). You can buy it for $23.95 each with quantity discount applies if you buy more. Check out the prices here. These extra large pails do not come with a handle since you won't be able to carry it yourself anyway. But they do come with removable and reclosable hinged lids. So after the relocation mayhem is over, you can put these huge plastic containers in the garage of your new home or workplace and use them for storing something else! Interested? Go and check it out right HERE.